I don’t really read chick lit, and I don’t much like long books. But for some reason I hadn’t quite computed that this was a long book, and it wasn’t pink and glittery, and it was set in DC, and I found it in the Lantern Bookshop in Georgetown for four dollars or so, so I went with it. 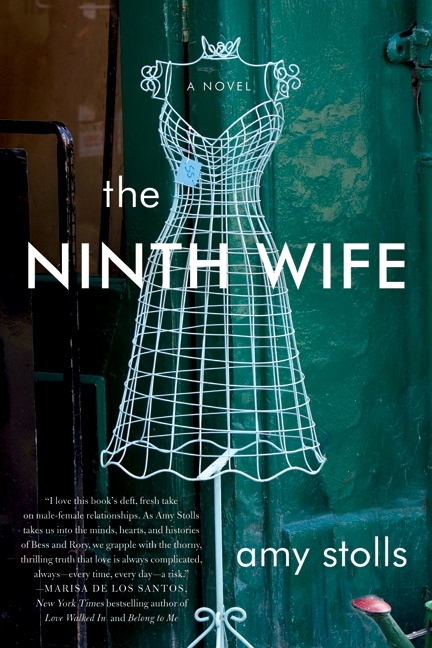 The Ninth Wife is not really chick lit – at least not the way that I think of it. It’s more in line with the kind of thing I aspire to write – intelligent fiction for women, with elegant writing. And Amy Stolls can definitely can write – there were some beautiful, beautiful turns of phrase, trudging through a swamp of disbelief, letting the whispering winds speak her concern, the route flirts with Pennsylvania all the way, it’s the part of Maryland that makes the state look greedy… There was also a lot of great insight about what it’s like to be in your thirties and single and beginning to despair as you watch everyone else around you turn into couples and then families. So, in other words, it was right up my street. I can forgive a book for not having much of a plot if it’s well written, and this was. Although it certainly didn’t lack plot, either. (At times, I wondered if there was maybe a bit too much of it.) Yes, at its heart, it’s about a relationship – Bess is dating a guy who has been married eight times before, and wonders if she should accept his proposal – but it explores so many different facets of life, of how we relate to each other, parent to child, grandparents to grandchildren, spouse to spouse, partner to partner, of how we grieve each other and deal with the past. The first half of the book is very different from the second. In the first half, chapters alternate between Bess’s life now and Rory telling the story of each of his previous eight wives. You’d think, wouldn’t you, how ridiculous. No one could be married eight times. And if he was, then you’d want to run. But as you read each of these stories they are (mostly) very believable, and you get to know Rory, and you know what, it’s not as ridiculous as it sounds. He had a tendency to get married a little too quickly, so really, it’s like someone having eight relationships before you. Maybe not ideal (at least in the circles that I move in), but allowable at the age of 45. What I like about this book – apart from the quality of its writing – is the realism of it. Life is messy, love is complicated, there are no easy answers, relationships don’t look like they do in Hollywood. This book feels like an exploration of what it means to trust and commit to someone given all of that. That said, it might have been nice if there had been just one example of a happy marriage between two straight adults who loved each other and stayed together. (Bess’ friend’s Gabrielle’s parents might have been one, I can’t remember, but she doesn’t dwell on the point if they were.) Amy Stolls shows us a rich tapestry of the many different kinds of relationships that can and do exist, but that one is completely lacking – and I do believe it does exist. And the author must believe it does, too, since that is what she’s steering her character towards. Then again, it’s no wonder Bess is so tentative about marriage if she hasn’t ever seen it work out in her social circle. Another criticism would be that there are a few too many coincidences which require a stretch to believe in them. I have to say, too, that I roll my eyes when a woman goes into labour at an inappropriate moment, nobody knows what to do about it, and then she proceeds to give birth pretty quickly afterwards. It was also as if the author had deliberately populated the book with as wide a variety of characters possible: the black best friend, the gay best friend, the lesbian ex-wife, the special needs relative, the Jewish grandmother, the airy-fairy floaty girl pregnant by the irritating ex-boyfriend. I imagine it was a deliberate choice, but it felt a little too deliberate. I don’t know why – all those people do exist, and it’s not beyond the realms of possibility that they all exist within one person’s social circle – but it felt a little forced. That said, these characters weren’t stereotypes – they all felt very real, in particular Bess’ gay best friend, Cricket. And, as someone has said on an Amazon review, their backstories are complex, and that give them depth. This is a great book for writers to study for hints on characterisation. I’ve been ill this week, so lying down for stretches of time has been an ideal opportunity to get into this book. There were times when I just could not put it down: I read it in big stretches and kept thinking, “What? I can’t stop now!”. I suppose that’s the joy of a long book, but it’s also the joy of good writing, characters you get to know and love, and a story that grips you (and yes, even makes you cry a little bit). A great book with which to start my reading year.